Going to need a strong drink after this one. Maybe four or five. 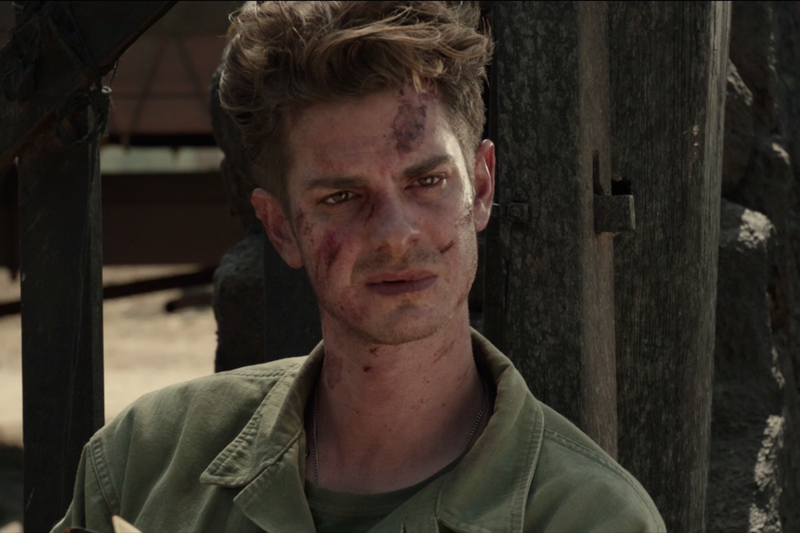 Desmond Doss (Andrew Garfield) has long been a God-fearing Christian, and all-around good guy, who’s seen a few things growing up that has shaped him to be who he is. Who he is happens to be a pacifist; he doesn’t believe in killing people or even handling a firearm. Being a pacifist isn’t an issue…except when Doss decides to join the Army as a medic in an effort to serve his country during its most important time in World War II. Even carrying the status of a conscientious objector, many in his squadron don’t believe Doss will be there when the chips are down and bully him into quitting. But a man of such strong conviction is one people should want on their side when the going gets tough, and it gets no tougher than Hacksaw Ridge, a battleground on the island of Okinawa that could turn the tide of the war if won. There’s really no point in comparing the two, but I can’t help it, as it is something that has stuck with me since early in the movie. Isn’t Hacksaw Ridge sort of like The Birth of a Nation? Not story-wise or anything, but both movies arrived in theaters with biographical subject matter, as well as controversial actions done by their directors. It can be argued (even likely) that Mel Gibson, director of Hacksaw Ridge, is much more controversial than director Nat Turner, for the simple fact that he’s been in the limelight longer for his actions to be unfurled. But like many things in life, winning cures a lot of ill will, and the same goes in cinema. Mel Gibson has a winner in Hacksaw Ridge. How does he do it? A multitude of ways, but it starts with the writing. Gibson’s not a writer in this, but co-writers Andrew Knight and Robert Schenkkan are. Together, they pen a compelling story about being convicted in one’s beliefs. Though Christianity is an important characteristic of the main character Desmond, this isn’t a film that pushes that, it pushes more the strength of the human spirit, and how anything can be done with the right determination. Granted, it isn’t a groundbreaking story, but it feels very authentic. Know how true stories and stories about biographical historical figures can be very Hollywoodized? Hacksaw Ridge doesn’t really feel as such, maybe because for all intents and purposes, this is a screenplay that is not exactly original, but by no means adapted, either. This does not mean that Hacksaw Ridge‘s screenplay is perfect, however. Some of the first third of the movie is a little too clunky for my personal liking. And though this is clearly a story about Doss, the second act of the movie (if ever so briefly but still) seems to want to explore a few other characters in the squadron, but the third act comes and hardly anything is known about any of them aside from some endearing nicknames. Otherwise, they are somewhat faceless entities. So not every character gets a lot of meat. But character shortcomings are not due to any fault of the cast. As Desmond Doss, Andrew Garfield turns in the work of his career, and it comes across so effortless. Okay, his accent isn’t completely on point, but it is more than passable and after a while, you stop listening to vocal oddities because he just sinks into the role. Every other actor/actress around him is firmly of the support fashion, but all stand out in whatever screentime they possess. Teresa Palmer can do so much more, yet she very captivating the moment she steps on screen, and Hugo Weaving could have an entire film anchored by his character, he’s that good here. One has to give it to Gibson to coaxing great performances from guys who aren’t known for dramatic work. 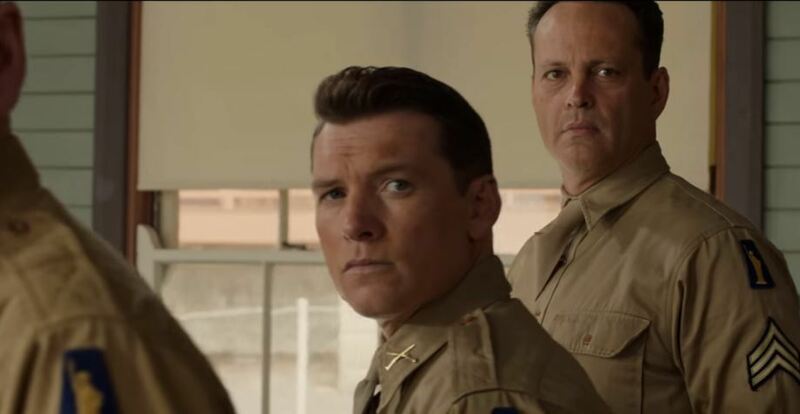 The troika of Vince Vaughn, Sam Worthington, and Luke Bracey all fit in perfectly. Out of the three, Bracey is the only other character in the entire feature who gets somewhat solid development. But being honest here, as great as the acting and as good as the overall story is, Hacksaw Ridge is going to be remembered for its unrelenting war action ultraviolence that dominates the 3rd act. It comes so sudden and doesn’t let up once it does. The Hacksaw Ridge battleground itself is extremely frightening, a mix of uneven geography, perpetual haze, and depressing grey. Gibson gets a little too slo-mo happy in the final moments, but otherwise, the comparisons to Saving Private Ryan are warranted. 10 years is a long time to be away from the directing chair, but it’s clear Gibson hasn’t lost much, if anything. Succeeding as first a stirring drama and then a visceral wartime action, Hacksaw Ridge isn’t likely to be forgotten anytime soon. Working on this one myself at the moment! I agree man, this movie was f**king powerful. I actually loved it. The gore and violence is totally justified. Lol, I did so much mental preparing for this thing, having read a lot of reviews that spoke about the bloodshed so I almost psyched myself out of seeing at one point. I’m glad I didn’t though because, regardless of those flaws, which I also completely agree with as well, this movie is really rewarding! Dude, I read so much too and not having the strongest stomach at times, I almost psyched myself out too in not watching haha. So glad I did as well, easily one of the year’s best. Garfield/Gibson should get serious consideration in their respective categories. I fully agree man. Garfield’s performance was utterly electric. I applauded at the end of this movie. Haven’t done such a thing, um . . .maybe ever. Good for Gibson for returning to fine form here. I’m writing something too and I’m right with the two of you. Can’t wait to read Keith! yeah I agree.. it’s def. not Platoon or Saving PR… but yep, I liked it. It was cheesy schmaltzy at the beginning.. but def. got good. And I think they could have cut it down just a bit..I mean after like the 10th guy being saved and watching the rope thing etc.. (which you knew the minute he did the rope wrong in camp-it would be used for something ha!) I think we got the jist. it’s been an amazing 2 weeks of film for me as I saw this, Loving, Arrival & Bleed For This all in a row. After a terrible year, to see 4 good ones in a row..just wonderful. I’m excited for the next 2 months…for films..mind you.. not with this country. Great review my friend. We’ve talked about this movie some already and I love reading your enthusiasm. As you know I’m with you. Powerful movie and very well-made. Now if we can just get more people to go see it. Didn’t expect this to get so much praise. Now I think I’m going to have to see it! I can’t say I loved this movie. Love is the wrong word. 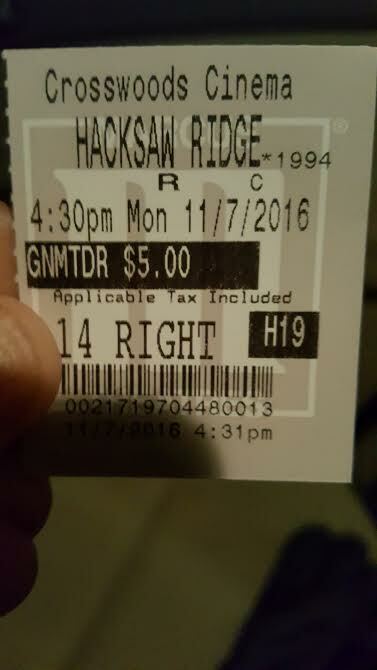 This movie moved me. It horrified me and filled me with hope. It was ugly and beautiful. I agree that the beginning and the end have a weird disconnect but I think that could work in the films favor. The contrast showing the collision of worlds that Doss is forced to exist in. The only thing that kept leaping out at me was the lack of vulgarity. A movie doesn’t have to have swearing, but it is almost necessary when you are portraying soldiers. I mean that was the War where the Fbomb became commonly used. I can’t think of any language in the film other than a few damns and shits. Just a little quibble in a film that will stay with me for a long time. Thanks for reading and commenting man! This really was moving, wasn’t it? I guess I didn’t think about the lack of swearing that much. Honestly, I’m not sure I would have noticed in that final act anyway with all of the visceral violence.